Memory can take you in unexpected directions. I wrote recently about student summer travel in the 1950s, and after the post was published, new memories kept rising to the surface. That happens: when you focus on one little piece of the past, its context gradually takes shape, carrying along scenes, events, and faces – occasionally, even names. After I posted Happy Birthday from Barcelona, I recalled something that made me think differently about that long-ago voyage on the SS Anna Salen. 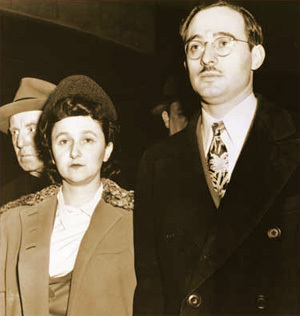 On June 19, 1953, Julius and Ethel Rosenberg were executed for treason and conspiracy to commit espionage by passing atomic secrets to the Soviet Union. Their trial and execution, especially the execution of Ethel Rosenberg, were bitterly contested at the time and remain an ugly scar on the problematic history of American justice. The case is not closed: on July 15 of this year the testimony of Ethel Rosenberg’s brother, David Greenglass was finally released, adding significantly to the overwhelming evidence that Ethel Rosenberg should not have been convicted, let alone executed. Her sons, Michael Meeropol and Robert Meeropol, have just now asked the Obama administration to exonerate their mother. The Rosenberg case is still painfully alive, but in the early 1950s it was a hot center of attention and dispute – what would now be called a wedge issue. Those were the years of loyalty oaths, of blacklists, of Joe McCarthy. The Rosenbergs were certainly Communists, and for some, that was sufficient cause to send them to the electric chair. For others, their execution was a gross injustice and an occasion for despair over the direction of American government and society. A large number (I have no idea how many) of the student passengers on the Anna Salen – representatives of what TIME magazine had recently named the Silent Generation – gathered to add our names and voices to thousands of last-minute protests and petitions against the execution. 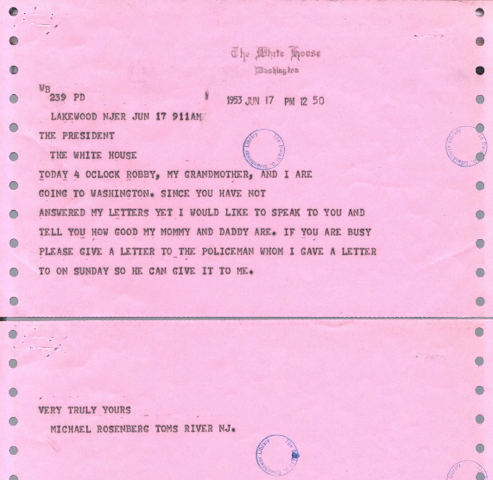 Such petitions, including a sad telegram from the Rosenbergs’ ten-year old son Michael, poured into the White House from all over the world. On June 18, 1953, we sent cables from shipboard to President Eisenhower, demanding clemency – to no avail, of course. Julius and Ethel Rosenberg were executed the next day, while we hung about the ship, playing bridge and foraging for food and drink. But I was glad to remember that we were not always, and not completely, Silent. Such a nice memory and, as you say, timely. Our ‘justice’ system is excruciatingly untrustworthy.